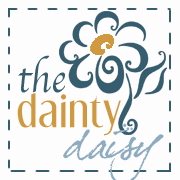 The Dainty Daisy: Rosie's Cozies is Ready for Action! Alrighty, I was a busy bee today running around town and making phone calls! I wanted to make sure that before we started this project that I had all of my bases covered! First, I got myself a P.O. Box. No, I do not think that my readers are crazy stalkers ready to hunt me down. I do, however, feel that there are crazy stalkers out there that I would rather not have find my home address if they happen to stumble upon my blog. Next, I called Helen DeVos Children's Hospital. I told the lovely woman on the phone what we were working on and she was was more than ecstatic. She said that the hospital can use hats from micro-preemie size all the way up through adult size. I am providing the preemie hat pattern I used for Rosie's hats, but it clearly sounds like hospitals in general need all sizes, so if you feel so moved please make some hats for all ages. I have also had a lot of people ask if they could donate money for yarn and things. I do not need money for yarn (just ask my husband), as I have an insane stash of yarn and these hats take so little. However, my sister spoke with Rosie's mom, Megan, who said that donating to the hospital would be a great avenue for these funds as there are some families who stay at the hospital while their babies are in the NICU. Money could help support this program for those families. 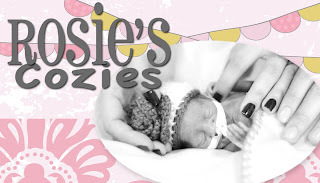 I am posting a DONATE link on the side of my blog for anyone interested in donating to Rosie's Cozies, and I can be sure the money makes it to Helen DeVos Children's Hospital. Or, you can always send the check to them yourself as they can probably give you a receipt for tax purposes. Okay, so without further ado.....that major basic beanie hat pattern I used for little Miss Rosie, as well as the add-ons to jazz the hats up. I have not tested any of these patterns since I wrote them up, so please let me know if something is written wrong. These patterns are not to be rewritten and sold elsewhere. Please feel free to use them for personal use, for donated items, and items you would like to sell. Yarn: I used worsted weight, as well as other weighted yarns. It created different sizes, which I think is just fine for this project as babies are going to have varying head sizes. Round 3: Chain 2. 1dc in same stitch, 2dc in next stitch, (1dc in next stitch, 2dc in next stitch) around. Join to first dc. (30dc). Sc evenly around bottom of hat edge and earflaps. Chain 4. Join to make a circle. Chain 10. Slst into circle. Continue this multiple times until you have a ball of petals. Finish off. Follow this link for the flower. This can be found on Ravelry here. I used a version of this I think. You can find it here. Round 1: Chain 2. 6sc in first chain. Do not join. Continue into next Round. Round 2: 2sc in each sc (12sc) Do not join. Round 3: 1sc in each stitch around. Finish. Leave a long tail so you can sew it to the side of the hat. To make inner ears I just did Round 1 and finished it off and then glued it to the outside ear. I added eyebrows by making a short row of sc with a different color at the top of the eye. Ears were tied to the top of the hat with 6 strands of yarn. Let's be sure that we make boy hats, as well as girly hats. You can make a basic beanie with some stripes to add a bit of pizazz, instead of the flower we add for the girly ones. I hope that I have posted enough to inspire and a pattern that is easy enough to follow! I don't want to put a date for everything to be sent, as I would like this to be an on-going project, however there is a photographer that would love to take some pictures of the hats when we get them in. I hope to be able to do this in the next month, so if you would like to see your hats in some pics, try to send them by August 15th. I can't wait to see the hats that are created in honor of this little life gone too soon. I love that you are doing this! I so wish I knew how to crochet! me too. I am still trying to figure out my gifts. they're in there somewhere. Are rounds 4-7 supposed to be 1 dc in each st around? If I repeat round 3 for these rows, I am increasing stitches correct? Thank you for doing this. I know what a blessing and a gift the things that volunteers make for sweet babies who comes to soon are :). i feel like my pattern is just going to keep getting bigger and bigger without making shape? which step makes it form a hat? sorry i'm new! what type of yarn would u suggest? ive heard that wool is out beacuse bubs can be allergic to it? Last week you had a photo of your copper hat display. I wanted to try one out of pvc, but can no longer find the photo. http://thedaintydaisyblog.blogspot.com/search/label/craft%20show. It is in thie post. I would choose softer yarns, baby yarn, cotton, etc. What is the circ and height of the finished hat? Thanks so much for posting this. Rosie's story really touched me and I can't wait to make some hats for my local hospital. I am crocheting all of my Christmas presents this year and for every present I make, I am making one preemie hat to donate. This is an awesome project! Hello, I made hats for a project and missed the date, so I called the local hospital to find out if they needed baby hats. They were thrilled and took everything I had available (50), all sizes for babies. They do not wash them, I used a nonallergenic laundry soap because I really didnt know what to use, but figured their skin is so fragile. I think that any hospital where babies are born might want hats that you have created. Our hospital said the need is large and they always need them. I was wondering if there is some way we could enlarge this pattern to use for adults. It would be fantastic to use this same idea for cancer patients!! 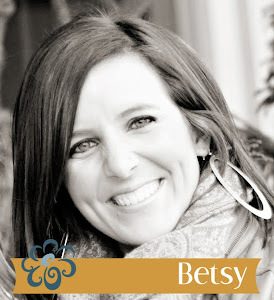 I was very touched by Rosie's story as I recently lost 3 grandbabies who were born too early. Our little triplets survived a very short time, and I would love to make hats for other little babies who have entered our world early and are trying to survive. I am a knitter, and do not know how to crochet. Does anyone have any patterns for knit hats for preemies? If not, I guess I'll just have to learn to crochet. And I will... to honor the memory of our precious little babies. Got the patterns and I can not wait to start!! I would love to do some of these patterns for older kids as well! Just have to figure out how to make them bigger. These are really cute, Love the owl one! Thanks for the patterns. Thank you for these patterns. I have made a couple of beanies for the hospital near us, but haven't handed them in yet. I would like to try the owl pattern and I like flower D. Thank you. (I live in Australia). I want to thank you so much for these patterns!!! My son, Owen, was born at 29 weeks and spent 6 weeks in the NICU. He is now 14 1/2 weeks (3 1/2 weeks corrected)and doing very well. I made a goal to crochet or knit a hat for each day that he was in the NICU to donate back. Life has been a little full to say the least but these adorable patterns may just be the motivation I need to get started on my mission! Thank you so much for sharing and God Bless Rosie for her beautiful life to inspire goodness. Thank you so much for all your patterns. I have made a lot for mg daughters and as gifts. I love your story about Rosie and if had inspired me to make some hats for my local NICU. On July 1, 2011 we were blessed with our Rosie. She was 6 days old and I was 7 months pregnant. Now they are 14 and almost 12 months old. I pray daily that Rosie's adoption is finalized, but it is a process. We also have two boys 3 years and 4.5 years old. I am truly blessed and I wanted to give something back. My cousin works at a local NICU and I love crocheting. Thank you so much. I cannot thank you enough for posting these patterns. I work in the NICU at Saint Mary's in Grand Rapids and have been searching for cute, more personalized patterns to make hats for all of our NICU babies. Thank you so much for these adorable patterns! These hats are appreciated so much by all of the NICU families and I can't wait to spread the love! I love this! came out perfect!! Thanks!! !